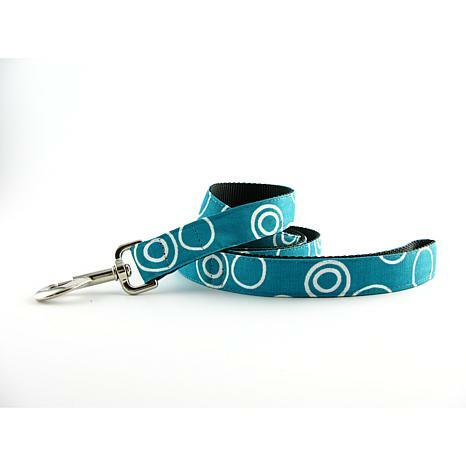 Cotton Trellis Dog Leash - Turquoise Circles 5' x 3/4"
Always wanted a designer dog? Now any pup becomes a posh pooch when you take her around with this colorful leash. 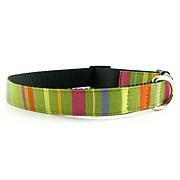 This durable textile lead offers the fashion-forward style your doggie so deserves. The designer-savvy look you want in charming patterns and happy hues, it elevates your dog's canine couture and makes a stylish statement. It's practical, tough and simply chic. The color was bright and perfect, but as with everything I ordered from this line...the xs was way too big for my chihuahua. I returned it and I had to pay for return shipping because this particular vendor does not pay for it. I am very unhappy with the situation on return shipping. Isabella Cane Cotton Buddha Dog Leash - Green 5' x 1"